For those of you who have not yet discovered the expansive world of stop motion animation using LEGO minifigures and parts, known as "brick films," I'm envious of you. You can still experience the joy of discovering a whole new world of procrastination and entertainment. And since I've been trying to act as a guide heretofore, I shall not stop now. So, consider me your Internet sherpa, and these the bricks films you should take the time to watch. "Trinity Help," is a short by Trevor Boyd and Steve Ilett that recreates bullet-time in an accurate frame-by-frame recreation of the classic scene from The Matrix. The creators have included an extensive explanation on the process behind the 440 hours it took to create the 90-second short. "Little Guys," is the signature work of David Pagano -- one of the most respected voices in the brick film world. It was his video that helped launch the "Go Miniman Go," campaign last year. "Don't Be a Jerk, It's Christmas," shows what happens when LEGO Sponge Bob is given a chance to sing. It's made by Garrett Barati -- the 2008 winner of the Built By Me Movie Contest sponsored by LEGO and Nickelodeon. 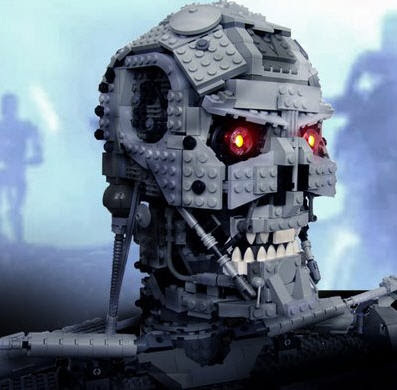 "Robota," is the first example of a brickfilm that I saw, which displayed how LEGO bricks can be as transformative as claymation or other forms of animation. Marc Beurteaux offers up a suprisingly moving story of a panhandling robot trying to make his way in a city of the future. If you feel compelled to strike out on your own, Brickfilms is a good place to start, both for those who want to create and those who just want to watch. Another great resource for people interested in LEGO animation is BricksInMotion.com. Much of the original Brickfilms.com community has since relocated there.